The organised begging racket in India is prospering substantially: Pay Attention !! The moment we realize somebody is knocking our car’s window while you stop at a redlight area and then when you open the windows, what you see is a poor looking lady carrying a baby in her arms whose face she covers with a shawl. Beggar: Sahab (sir), me and my child are hungry from few days as we don’t have anything to eat. Please give some money. Beggar: Sahab, god will bless you if you could give us at least something. Beggar: Please Sahab Please, give us something, give, give, give, please !! We: Fine, here you go (money is given). Many times we don’t even realise or know that the baby or a child which she is carrying in her arms is not even her own, but of someone else. Many a time, we find little kids are also begging on the streets or on the red light in full swing. we are often driven by this preconceived notion that if we give some bucks to the beggars, we will be blessed by God or money will shower on us too sometime in our lives. Which in fact is not true at all. By giving alms to beggars will, in turn, encourage them to beg more often as they have realised that this is a very lucrative profession. Despite India’s growth economically within the past several years still, there are such menaces going on in India which needs to be dealt with. 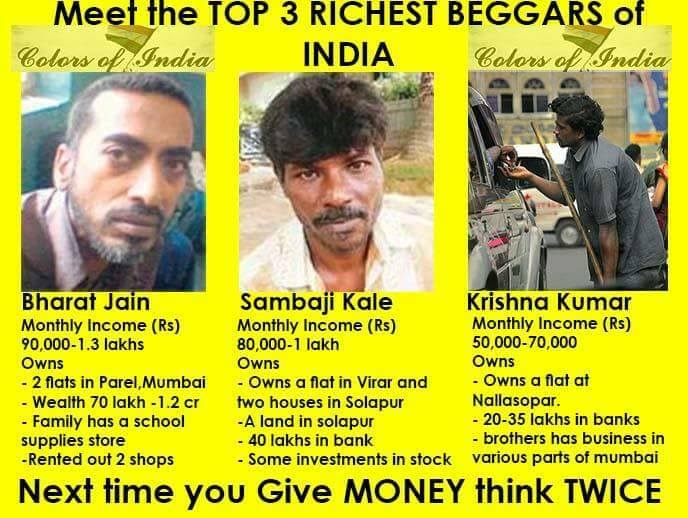 Poverty is real in India, but Begging is a complete scam if we pay close attention to it. But in reality, there are only hand few people are actually be called as real beggars as they are below the poverty line and somehow not employed because of being physically or visually impaired. Most of the times the whole family is involved into begging as otherwise, they won’t be able to feed the entire family so they go in multiples to reap more to earn daily bread. 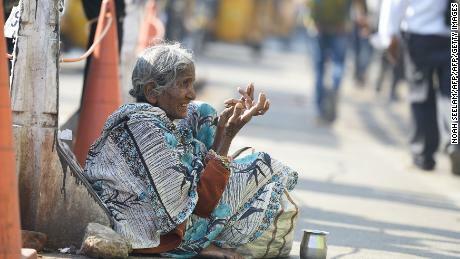 It’s has been find out that there are over 5,00,000 peoples engaged into begging in India which means half a million. Unfortunately, neither any laws are made by our India’s constitution to take strict action against such menace despite knowing the fact that begging is illegal in India nor any CSR Initiatives are taken to take charge of it and curb this issue. Moreover, many children in India are abducted and forced into begging on the streets. Provided statistics are really shocking as approximately 40,000 children are abducted every year according to the Indian National Human Rights Commission. Nearly half of the children whereabouts still remain unknown. Moreover, it is estimated that almost 300,000 children across India are either drugged and/or beaten and forcefully made to beg on a daily basis from a few sadistic peoples who are very powerful and resourceful. Sometimes, police officials are also get tricked from such peoples because of which such things remain unaware of, making every one ignorant about the issue. While talking about poverty which is a reality, begging is most often carried out in organized groups. The group leader assigns different “lucrative areas” to different members where they have to beg and at the end of the day, the majority of the collection goes to him/her. Beggars of today’s generation have also mastered the art of disguise by deliberately disfiguring themselves to gain more sympathy and reap out more money out of people’s pockets. Check this out !! Some welfare organisations/NGO’s in India are constantly aiming to reduce begging, by providing employment to the beggars, with due success. The most common problem is that the beggars have become so habitual of their habit of begging that they actually prefer to continue it rather than doing hard work and then earn because that seems stupid to them. Additionally, a majority of them do make more money from begging in comparison to what they would have earned if they did a full-time job. There is a boy(name not known) who completed a B.Tech degree, and finally landed a job into a corporate after struggling for placement. The matter of fact is, that he later also struggled a lot to keep up with his earnings as it was too meager to meet his daily expenses. One day while he was in Varanasi, he got hold of an idea when he saw beggars begging in masses. So, what he did was that he gave a resignation in his office, started living on the streets dressed as a beggar and within few days he built a big gang by teaming up with several other beggars and started earning big. Being interviewed by a News channel correspondent, he said, now I am earning more than triple times as I used to earn being engineer and thereby living peacefully. This thing holds really true as the numbers of beggars are increasing substantially in areas like Delhi, Gurgaon, Noida, Mumbai, and West Bengal. The quantity is also comparatively higher in states like Uttar Pradesh, Madhya Pradesh, Bihar, Rajasthan, Maharashtra, Andhra Pradesh, Assam, and Odisha. Even in places like Bengaluru (IT hub of India), a begging scam has been busted by police officials where a mother and her son have abducted 7 to 12 year old children in their home in yelahanka and made them to beg on daily basis. In Delhi/NCR, beggars have come up with street smart ways to loot money out of peoples pockets like what I have encountered so many times at bus stops and adjacent metro stations. They will come up to you in multiples of 3 or 4 making a sad and grievance face, holding bags and luggage etc and will tell you that they have come here from a different state and unfortunately their money have been lost/looted away by some people. Thereby they will try to convince you to give them some money so that they could meet some expenses for quite a few days. While it is hard to tell nowadays whether the beggar you encountered are for real or just made up. But as far as the real ones are concerned then, the children must be stopped from begging on the streets as they also pick drugs as an addiction alongside, rather should be sent to NGO’s like our’s Drishti foundation Trust who take really good care of these underprivileged children by providing them love, education, shelter, clothes, food and every basic amenities so that they do feel empowered and feel a part of our society and later on get employed and could stand on their own feet. Speaking for the elderly, they should be sent to the old age homes who will take good care of them with respect to everything they would be needing. Young women should be given employment in skilled labour role or daily wage earning role so that they get occupied with some productive work and can thereby earn daily bread for themselves. Should not be given any alms as it promotes more of begging and increase their spirit of enjoying it too. A beggar begs only for love and support, but not for money. It is high time for every one of us to pay serious attention to this issue as it portrays a very negative image worldwide as when tourists from all over the world, visit our country do get trapped by the tricks of these beggars and don’t have a clue what to do further, and so they end up paying loads of money as beggars are very beggars are very consistent in their approach. Not only it is something which institutions like NGO and the government should take care of but is equally our responsibility also.